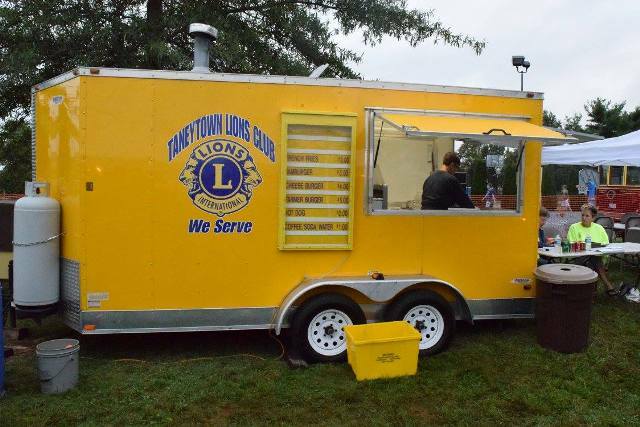 The Taneytown Lions Club was organized June 24, 1947, sponsored by the Union Bridge Lions and chartered September 9, 1947 with 29 charter members. The club continues to serve the community with many service projects, donations to worthy causes, and help in times of need. We support Lions number one priority of Sight Conservation and aid to the visually impaired with significant contributions to the Maryland Eye Bank, Lions Vision Research Center (LVRC), and Leader Dog Program. We have helped many needy individuals locally with eye exams and glasses. Lions everywhere are proud to proclaim that 100% of all proceeds from fundraisers are donated. Administrative costs are absorbed by dues and internal club activities. The Taneytown Lions Club honored honored 9 area youth sports and arts organizations on their “Youth Outreach Night” This is an annual event where funds collected over the year from several club fund-raisers are donated to Taneytown area youth organizations. In most instances the funds received by the organizations will go toward scholarships that will enable children to participate who otherwise could not afford to do so. In addition to the donations, Taneytown Parks & Recreation Director Bob Mitchell expressed his personal appreciation for the dedication and time given by all the volunteers that make up these organizations. The Taneytown Lions Club honored 12 area non-profit service organizations on their “Donation Night” This is an annual event where funds collected over the year from several club fund-raisers are donated to area service organizations that provide needed services to the residents of Taneytown and Carroll county.